You are currently browsing the CrackedActor.com – a David Bowie fan site weblog archives for January, 2008. Apparently Neil Gaiman and your humble CrackedActor webmasters weren’t the only people to pick up on how much Johnny Depp sounded like Bowie in Sweeney Todd. Depp recently said that he did not draw a direct inspiration from Bowie, stating “I wouldn’t ever dream of attempting to channel David Bowie because he is one of my heroes. But if there is a similarity it wasn’t intentional. It’s a nice compliment though.” Hell, if someone told me I sounded like Bowie my response would be, “Yeah, that’s right I took some major inspiration from him. David Bowie rocks my socks and we can all thank him for most modern music.” But that’s just me. As fan-boys and fan-girls are wont to do with a treasured book that is being adapted for the silver screen, MTV.com ran an article with their ideal cast for the eventual ‘Hobbit’ movie. For the part of Thranduil, king of the Elves of Mirkwood (Silvans to you Tolkien geeks), MTV.com would cast Bowie. On the surface it seems like an awesome choice…until you recall that Bowie is a bit campy in every movie he’s in. Except ‘The Prestige’, he did amazingly well in that movie. Not necessarily a bad thing, but the exact wrong thing for a movie adaptation of Tolkien. Anyhow. I don’t see Bowie as the type of actor who could disappear into a role like the part of Thranduil would require. This is a man who is used to projecting his facial expressions and body movements to thousands of people – it would be a complete mismatch. However, if there were talk of casting him as Cellophane in ‘Bored of the Rings‘ I would totally be on board with that. 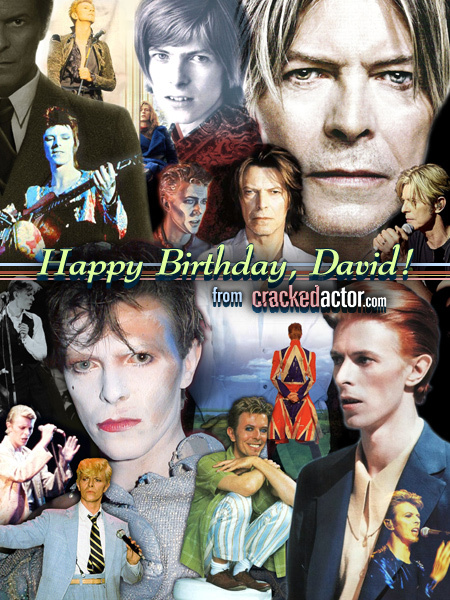 The Webmistress and I want to wish Mr. David Bowie a very happy 61st birthday today! Tomorrow, we, of course, will go back to wishing he will release a new album this year, but today we selflessly wish him a killer day full of fun, family and friends. All the best! Posted in News | Comments Off on Happy Birthday, David! Like us, you’ve probably wondered what it would be like to have Lindsay Lohan resting on your shoulder or Senator Larry Craig nestled against a bicep. 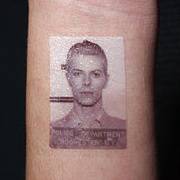 Well, we’re making those dreams a reality with these Celebrity Mug Shot Tattoos, the easiest way to temporarily get close to your favorite perp (without risking a messy restraining order) . . . . So just add water and you’ll be able to put Paris Hilton’s face where we all know it belongs. The tattoos come in two packs – The “Class of 2007 Edition” and the “Hall of Fame Edition” and have also been included in prize packages for Smoking Gun’s online contests. One of the Christmas card recipients was New York Magazine, which wrote this article about them. Another was the MJ Morning Show radio program who posted this photo gallery of the tattoos being applied to appropriate locations on an intern’s body.